There was a thread in the Flickr Name That Film group about making fake DVD covers for movies that are never likely to get a release from the arty label Criterion. 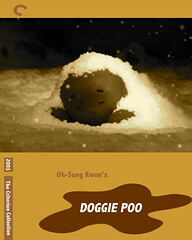 I submitted my favorite Korean stop-motion movie about a talking turd, Doggie Poo. PS. You don't ever want to search for "doggie poo" in Google Images. Trust me on this.